Qigong, the subject of this series in Doctors Health Press, is a mainstay of Traditional Chinese Medicine. It is an amazing performance of slow, simple movements and postures that wind up being so good for you. Qigong combines movement with meditation. There are at least 1,000 types, all involving either a simple routine of calisthenics, or a complex set of exercises intended to boost heart rate and brain waves, and strengthen organs. Qigong is best learned from a practitioner. Ensure yours understands the philosophies behind Chinese medicine. Smaller classes are better for teaching and learning, find the one that is right for you. There are also instructional DVDs and books available. — Prepare. You can’t ever rush Qigong, so set aside a certain amount of time for it, rid yourself of distractions, and get out some comfortable clothes. Spend a few minutes collecting yourself and calming. Ensure you are comfortable with the temperature. Once relaxed, you’re set to go. — Stretch. Take two minutes and gently stretch the body out. Move your joints around, stretch out the muscles…nothing too strenuous. Just get the blood moving. — Learn the Wu Chi. This is the opening position used every time. Stand with feet shoulder-width apart, bend your knees only slightly, and let your arms and hands fall loosely to each side. Let your shoulders and spine align naturally and allow your stomach to expand naturally with each breath. Your head points straight ahead. Qigong helps us maximize the flow of the life force called “Qi” so that your health and overall well-being are vibrant. It is reputed to do many things in the body. Perhaps the best known effect is that could help lower blood pressure. Qigong may also reduce your heart rate and improve circulation. A few other well-believed benefits include increasing the amount of oxygen to tissues all around your body, helping eliminate waste products, boosting the immune system and the delivery of white blood cells, and improving mood by shifting the chemistry of the brain and nervous system. At the very least, it relaxes you and it improves your fitness levels. 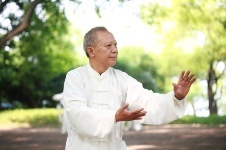 More and more studies are adding to the evidence that Qigong can directly affect the course of a condition or protect you from one. Here is a fast look before we get to some of the studies: high blood pressure; complex regional pain syndrome; digestive problems; chronic pain; arthritis; depression; anxiety; weak bone density (risk of fractures); headache; insomnia; and poor circulation. PLUS: Tea’s interesting effects on blood pressure. In the next part of this article series, we’ll unveil five signature “moves” of Qigong.